According to DRB-Hicom managing director Datuk Syed Faisal Akbar, the planned introduction of the locally-assembled (CKD) Proton X70 is currently on schedule, and will take place this year. When it is launched, the CKD version of the X70 will replace fully-imported (CBU) units that are currently still on sale. “The upgrading works and preparation of Proton’s plant in Tanjung Malim to support local assembly of the X70 is going as planned and almost completed. Following that, test assembly of the vehicle will commence as well as fine tuning the processes to ensure quality is at its best. Similarly, all vendors involved are being prepared for this purpose,” said Syed Faisal. On the matter of the amount of local content that will be used for the X70 CKD, no percentages have been revealed for now. “However, features such as the GKUI infotainment system will be updated and revised for local users,” he added. As an example, the maps used for the navigation function in CBU cars is based on a Baidu version developed in China. When asked if DRB-Hicom is continuing to invest in Proton after Geely became the national carmaker’s strategic partner, Syed Faisal explained that all investments into Proton together with Geely is done in two ways. The first is based on the percentage of shareholdings and interest, which involves both companies – DRB-Hicom (50.1%) and Geely (49.9%). The second way, being the main method of investing, is through bank loans. In other words, both stakeholders are directly involved in investing in Proton. This post is adapted from an article posted on our sister site paultan.org/BM. Proton is doing so well now. In 20 years, sales were so bad and company was mismanaged. Our local CEOs, the past 20 years, could not identify this. 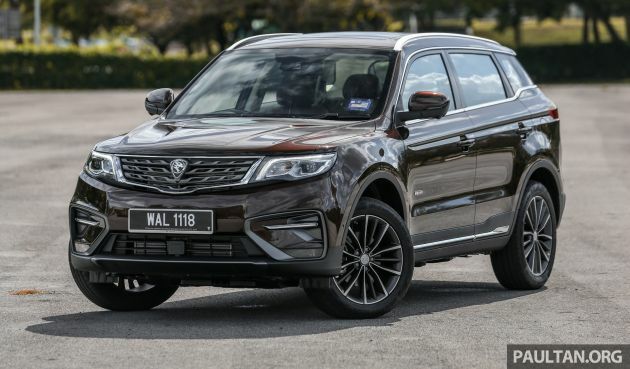 Proton X70 rivals are GLC200, BMW X3 & Q5. Nenek old already, never read and follow latest auto news. dude, it is not even rebadge assembler work now but a reseller as all work is done in China! there is no work for malaysian locally! The other news mentioned DRB said not so soon! Its helping China GDP than Malaysia! And what’s the other option???? Continue with the same way of doing things, coming out with vehicles that can’t even break even, keep using Euro4 compliance engines, keep banging head on the wall with the yearly reported losses, keep asking gomen for money …..????? Yah, make huge yearly losses, keep asking gomen for bailout & the fat cats all laughing to the offshore banks. All just to shiok sendiri, be kampung champion, keep head under the coconut shell. Contribute to Msia GPD konon. Bu+0h lah. Tahniah! Onwards to gip Boyue/X70 into the proud ownership of 1 million customers. 25k bookings and that after 8k delivery? This is the hotest SUV in MY history. Booking fee must be very low la.. Duno hw many loan rejected !! All units shipped to Malaysia were took up. This doesn’t reflect a low booking fee nor high loan rejection. You are referring to the Aruz? Many Aruz loans got rejected because salary not enough. I heard now have ready stock and no need 10% downpayment. Once CKD in here, expect the quality to drop 10X and Game Over. Moreover, massive cancelation of X70 bookings will happen and all move the Game Changing Aruz with top quality! You have been telling us that since Aruz came on sale, but what we see today is Aruz bookings are being cancelled and many would rather wait in line to get X70. 40k minus 25k still profit 15k what. Sell it below RM20k , before discount..
U r asking CRV sell below RM60k. Then why is CRV quality crappier than a China car? Change ur head laa…tok kok here and fake ID somemore. Aruz now less 3000 units behind of X70. after sales still the one badly need improvement. for instance, many cars found PDI QC not done. secondly, technicians sayign or claiming this is normal, that is normal. china car. what do you expect. thirdly. spare parts availability. make sure common neeed parts like front and rear body parts and windscreen and side mirrors are always readily in stock and not need 3 weeks to wait for order. Since only you didn’t realise, FYI the aftersales have been thoroughly revamp in line to be 3S/4S centers. Aftersales satisfaction have been increasing ever since then. Agree. This is a general statement. The 3S/4S although has improved drastically, still need to improve more. Bear in mind, the hardware can easily be upgraded (just need money for renovation) but most crucially, the human capital (software) is the most important factor to upgrade. Not just education but also change mindset. But, to be fair, Regal Motors PJ has so far been doing a good job. The Service Advisor Mr. Wan knows his stuff & the mechanics so far has not screwed up. Can see they try their best & have good attitude. Kudos to them. But the vendors yes… they have toed the line. That to me is the single most significant progress in the carmaker. It is now run like a business should. No government interference is also a boon. Yes, credit is somewhat also due to CEO Li. He cracjed the whip, and is exactly what Proton needed, just as Malaysia needed Mahathir’s alleged dictatorship in the early 80s, and how Singapore needed Kuan Yew’s also alleged dictatorial style in the mid-60s. Proton better be on schedule !! Original plans was for end Q1 but later on reschedule to Q3. So earliest CKD come out for sale is only Q4. Hopefully the new localised GKUI software will also be available for upgrade (download) for CBU units. Baidu maps is like the very early versions of Google Maps (pre Waze integration). Not very clever routing AI, not many POI, unable to save to favourites, traffic notification not accurate etc. Baidu maps talks too much, it’s like having your mother-in-law ranting on and on the entire route, “go straight, keep going straight, after this traffic light go straight ….” Heck, they can’t even get basic English Grammar correct, it’s as if the spoken instructions were literally translated from Mandarin. The only thing good about it is the Junction View (more intuitive than Google Maps).